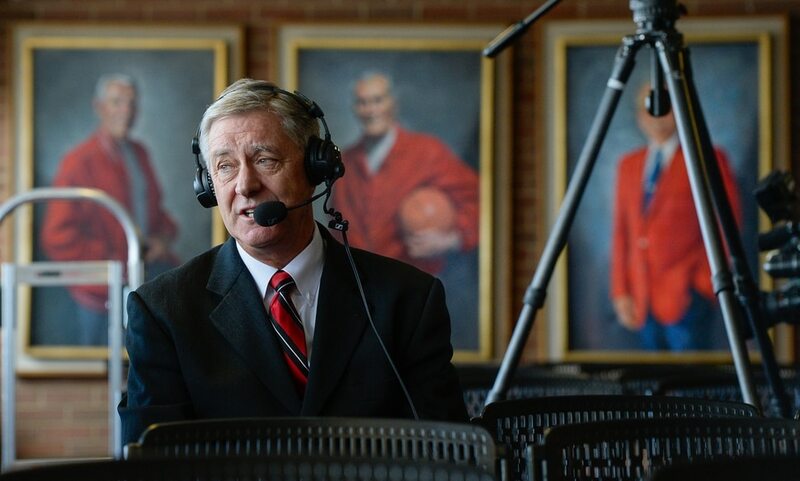 (Francisco Kjolseth | The Salt Lake Tribune) University of Utah Athletics Director Chris Hill does a radio interview following after announcing his plan to retire this spring after 31years. In background are former athletic directors and coaches on display at the Jon M. Huntsman Center on campus on Monday, March 26, 2018. Hill is the longest actively tenured athletics director at the same school in the NCAA FBS. (Francisco Kjolseth | The Salt Lake Tribune) University of Utah Athletics Director Chris Hill announces his plan to retire this spring after 31years. Joined by his wife Kathy and their kids and grandkids at the Jon M. Huntsman Center on campus on Monday, March 26, 2018, Hill is the longest actively tenured athletics director at the same school in the NCAA FBS. 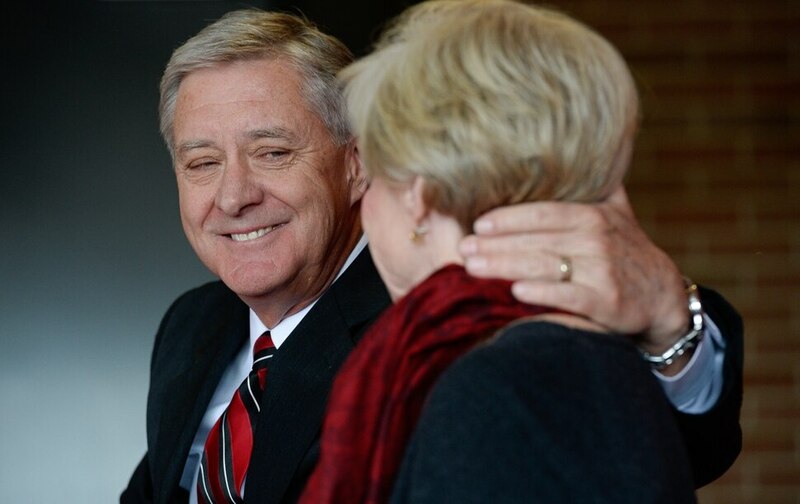 (Francisco Kjolseth | The Salt Lake Tribune) University of Utah Athletics Director Chris Hill acknowledges his with Kathy as he announces his plan to retire this spring after 31years. Joined by friends and family at the Jon M. Huntsman Center on campus on Monday, March 26, 2018, Hill is the longest actively tenured athletics director at the same school in the NCAA FBS. (Francisco Kjolseth | The Salt Lake Tribune) University of Utah Athletics Director Chris Hill announces his plan to retire this spring after 31years. Joined by his wife Kathy and their son and daughter and grandkids at the Jon M. Huntsman Center on campus on Monday, March 26, 2018, Hill is the longest actively tenured athletics director at the same school in the NCAA FBS. (Francisco Kjolseth | The Salt Lake Tribune) University of Utah Athletics Director Chris Hill holds an emotional announcement to retire this spring after 31years. Joined by his wife Kathy and their kids and grandkids at the Jon M. Huntsman Center on campus on Monday, March 26, 2018, Hill is the longest actively tenured athletics director at the same school in the NCAA FBS. (Francisco Kjolseth | The Salt Lake Tribune) University of Utah Athletics Director Chris Hill announces his plan to retire this spring after 31years. Joined by his wife Kathy and their kids and grandkids at the Jon M. Huntsman Center on campus on Monday, March 26, 2018, Hill is the longest actively tenured athletics director at the same school in the NCAA FBS. (Francisco Kjolseth | The Salt Lake Tribune) University of Utah Athletics Director Chris Hill announces his plan to retire this spring after 31years. Joined by his wife Kathy and their kids and grandkids at the Jon M. Huntsman Center on campus on Monday, March 26, 2018, Hill is the longest actively tenured athletics director at the same school in the NCAA FBS. (Francisco Kjolseth | The Salt Lake Tribune) University of Utah Athletics Director Chris Hill announces his plan to retire this spring after 31years. Joined by his wife Kathy and their kids and grandkids at the Jon M. Huntsman Center on campus on Monday, March 26, 2018, Hill is the longest actively tenured athletics director at the same school in the NCAA FBS. (Francisco Kjolseth | The Salt Lake Tribune) University of Utah Athletics Director Chris Hill embraces his daughter Aly Hill and her son Jack Forsyth, 7, after announcing his plan to retire this spring after 31years. Joined by his wife Kathy and their kids and grandkids at the Jon M. Huntsman Center on campus on Monday, March 26, 2018, Hill is the longest actively tenured athletics director at the same school in the NCAA FBS. (Francisco Kjolseth | The Salt Lake Tribune) University of Utah Athletics Director Chris Hill, at right is joined by family for a photo after announcing his plan to retire this spring after 31years. (Francisco Kjolseth | The Salt Lake Tribune) University of Utah football coach Kyle Whittingham speaks with the media following the retirement announcement by Athletics Director Chris Hill during a press event at the Jon M. Huntsman Center on campus on Monday, March 26, 2018. 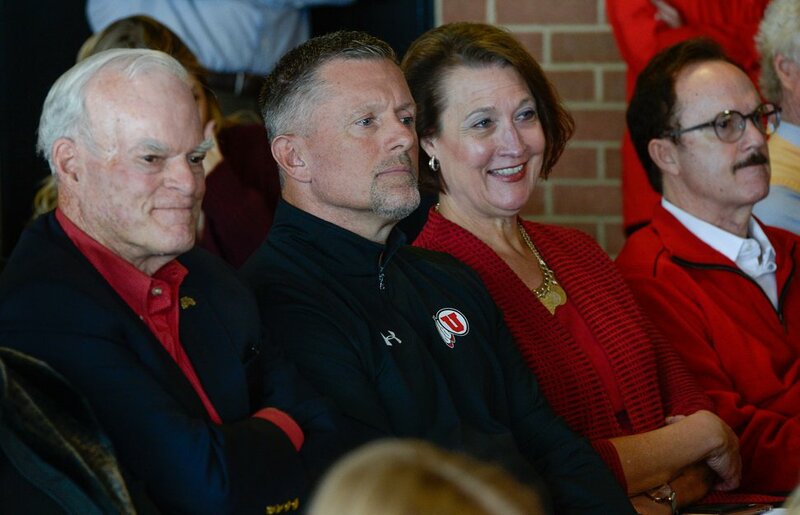 (Francisco Kjolseth | The Salt Lake Tribune) Greg Marsden, former University of Utah gymnastics coach and his wife Megan who took over his position joins the crowd gathered for the announcement by the U's Athletics Director Chris Hill that he plans to retire this spring after 31years. (Francisco Kjolseth | The Salt Lake Tribune) University of Utah Athletics Director Chris Hill is embraced by his grandson Jack Forsyth, 7, after announcing his plan to retire this spring after 31years. (Francisco Kjolseth | The Salt Lake Tribune) Philanthropist Spencer F. Eccles, University of Utah football coach Kyle Whittingham, U. President Ruth Watkins and philanthropist Tom McCarthey, from left, attend the retirement announcement of Athletics Director Chris Hill after 31years. Joined by his wife Kathy and their kids and grandkids at the Jon M. Huntsman Center on campus on Monday, March 26, 2018, Hill is the longest actively tenured athletics director at the same school in the NCAA FBS. (Francisco Kjolseth | The Salt Lake Tribune) Aly Hill looks over at her daughters as her father, long time University of Utah Athletics Director Chris Hill tells stories during his announced plan to retire this spring after 31years. Joined by his wife Kathy and their kids and grandkids at the Jon M. Huntsman Center on campus on Monday, March 26, 2018, Hill is the longest actively tenured athletics director at the same school in the NCAA FBS. The moment he always knew would one day come was suddenly here, and all it took was 15 seconds for it to dawn on him. His voice cracked. His eyes watered. He nervously scratched his arm. Chris Hill had a game plan Monday, and he had to execute it. To summarize four decades in one place, to relive the ecstasy and the agony intertwined throughout 31 straight years in one job, was impossible. He even said it himself. He had to stay on track in his Monday morning news conference. Soon, in a couple of months’ time, he was no longer going to be Chris Hill, athletic director at the University of Utah. If he wavered, if he chose to single out a highlight on a field or a court, the tears would soon return and might not relent. So he glanced down at the binder he brought out with him from behind the crimson curtain inside the Huntsman Center and tried — tried — to stick to the script. At the end of May, Hill will retire at age 68. The longest actively tenured Division I athletic director at the same school is changing direction after 31 years on the job and a historic résumé of achievements that helped launch the Utes into realms thought unattainable at one time. 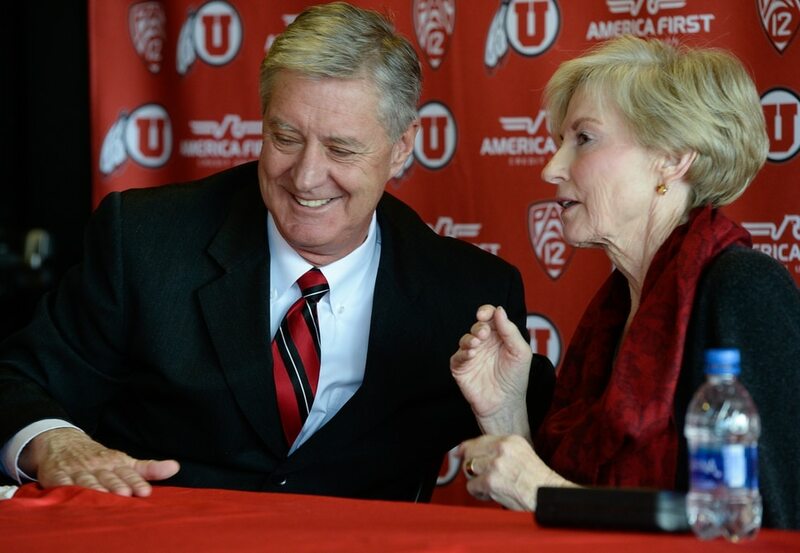 Hill and his wife, Kathy, were in Paris as he helped navigate Utah’s eventual inclusion in what would become the Pac-12 Conference in 2011. He took call after call. That was a vacation they’d never forget. As her husband bounced from interview to interview Monday morning, Kathy Hill stood inside the Huntsman Center room where he made it official and beamed. (Francisco Kjolseth | The Salt Lake Tribune) Philanthropist Spencer F. Eccles, University of Utah football coach Kyle Whittingham, U. President Ruth Watkins and philanthropist Tom McCarthey, from left, attend the retirement announcement of Athletic Director Chris Hill after 31years. Joined by his wife, Kathy, and their kids and grandkids at the Jon M. Huntsman Center on campus on Monday, March 26, 2018, Hill is the longest actively tenured athletic director at the same school in the NCAA FBS. It was a blockbuster move that captivated not only a burgeoning fan base riding high after two undefeated BCS-bowl winning seasons in 2004 and again in 2008, but also served as a proclamation that Utah would become a mainstay in the national conversation. Hill’s goals of revamping Utah’s football program paid off in hires of Ron McBride, Urban Meyer and Kyle Whittingham. Whittingham said the most appropriate way to gauge Hill’s success, at least for football, is comparing the past to the present. “It’s night and day,” said Whittingham, who has been head coach since 2005. On the basketball court, Hill hired the late Rick Majerus, who took the Runnin’ Utes to the NCAA title game in 1998 and 12 total NCAA Tournament appearances. Current Utah coach Larry Krystkowiak has led the Utes to two NCAA tournaments. The team is currently in New York City to play in the NIT Final Four. There were some encounters with choppy waters, as well. Parents of former Utah swimmers voiced concerns and said the athletic department didn’t properly investigate allegations of physical and psychological abuse by former coach Greg Winslow in 2013. Hill was chastised by U. administrators for that. His decisions to (temporarily) pull the plug on the BYU football rivalry, and later buy out a road basketball game at BYU, created a backlash and later spawned a legislative audit of the Utah athletic department. But the results speak for themselves. During Hill’s tenure as athletic director, Utah has won 10 NCAA championships in both gymnastics and skiing and combined to finish national runners-up 14 times. Since joining the Pac-12, Utah has won four conference titles in gymnastics and baseball. Utah football shared the south division championship in 2015. “Those who haven’t worked for Chris or with Chris may not fully appreciate the culture that he developed here,” said former Utah gymnastics coach Greg Marsden. Hill was asked what accomplishment he was most proud of during his 31 years at Utah, and that was his answer: What Utah didn’t have before and what it has now — which is why he felt now was as good a time as any to step away. Hill has one more job to do. With about two months left before officially retiring, he said Monday he is determined to raise $20 million of the necessary $25 million for a long-developing plan to expand Rice-Eccles Stadium. It would be the final feather in a cap that’s featured millions of dollars in upgrades to the school’s student-athlete facilities. Since entering the Pac-12 alone, Utah has built the Dumke Family Softball Stadium (2013), the Spence & Cleone Eccles Football Center (2013), the Jon M. and Karen Huntsman Basketball Center (2015) and the Spence Eccles Ski Building (2017). “He’s been grinding as of late just as much as Day 1 [on the job],” said Utah volleyball coach Beth Launiere. 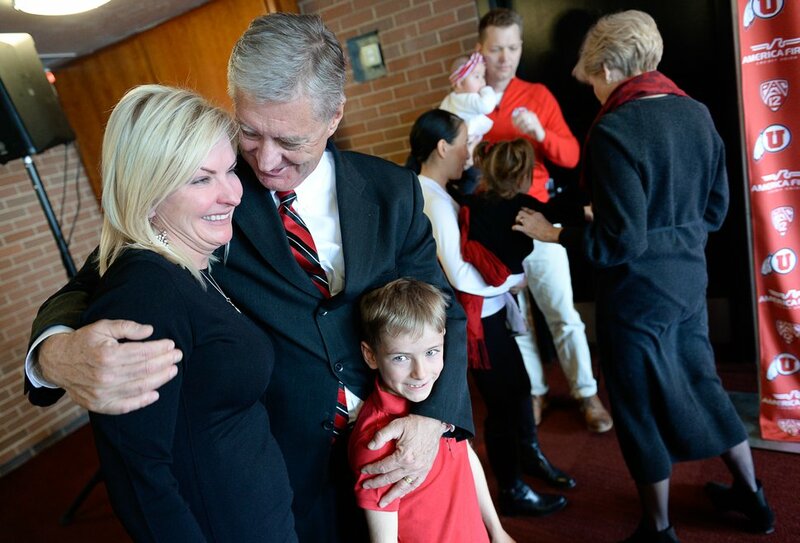 (Francisco Kjolseth | The Salt Lake Tribune) University of Utah Athletic Director Chris Hill embraces his daughter Aly Hill and her son Jack Forsyth, 7, after announcing his plan to retire this spring after 31years. Joined by his wife, Kathy, and their kids and grandkids at the Jon M. Huntsman Center on campus on Monday, March 26, 2018, Hill is the longest actively tenured athletic director at the same school in the NCAA FBS. Hill asked himself that question before the reporters in the room could ask it themselves. The choice was made in January, he said, explaining that he went with his heart and it was the right move. “He had an awesome run,” son Christopher said. Hill has already told U. President Ruth V. Watkins that he would be willing to help out here and there, would be open to lending some advice during the search for his replacement, but said he does not want to be on any sort of committee. He does not want to hover. Instead, he’s looking forward to the unexplored. Hill said he wants to write a book. He wants to leave a tied ballgame with three minutes left on the clock, just to see how it feels not to be obsessed with the outcome of a game. Kathy Hill joked that she’s not ready for the next phase, because it’s never really been part of the equation. As Chris Hill kept on explaining his decision to retire, leaving the only real post he’s ever known, Kathy told stories of just some of the schools that came calling. Oregon, Washington, Duke. They were so close to moving to Seattle and becoming Huskies at one point, she said, she had already picked out a purple scarf for herself and a purple tie for Chris for the news conference. But on Monday, the reality was never more apparent. A few steps away, their grandchildren wore Utah moccasins and had red bows in their pigtails and sported red polo shirts. Like Chris Hill, they’re Utes.